It’s little wonder there never seems to be enough money left over to save for those in-between things you hope to achieve in the not-too-distant future. Things such as your children’s education, a home deposit, renovations or a new car. 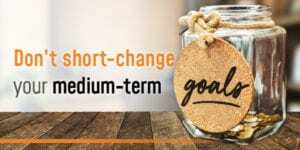 These goals will differ depending on where you are in life, but whether you are 25 and saving for a home deposit or 55 and wanting to buy a boat, you need a plan. Otherwise you might be tempted to use high interest loans and credit cards or simply borrow more than you can afford.